Yu Feng, president of the Central Conservatory of Music and also a native of Ningbo, helped his hometown found the first professional symphony orchestra two years ago. Yu Feng, president of the Central Conservatory of Music and also a native of Ningbo, helped his hometown found the first professional symphony orchestra two years ago, marking the beginning of Ningbo’s move to become a music city. An open course on classical music was held in the Yinzhou Gymnasium in Ningbo during this year’s summer vacation. The Ningbo Symphony Orchestra performed 20 Chinese and foreign classics and Yu introduced and explained the instruments and spoke about the classical arts during the course. More than 4,000 people attended the free course. "Not all economically developed cities can have a symphony orchestra as it requires as good cultural ambience," said Yu, born in 1964 in Feng'ao Village, Yinzhou District, Ningbo. "Ningbo is a historic city and people here need a professional symphony orchestra to provide them with classic music." Ningbo is a significant cultural city in East Asia with history dating back 7,000 years. "Ningbo became ‘Culture City of East Asia’ in 2015," said Chen Yanqun, department chief of Arts in the Ningbo Bureau of Culture, Radio, TV, Press and Publications. It is an annual cultural campaign among China, Japan and South Korea that chooses a city in each country. "Since then, we decided to enhance Ningbo’s cultural influence by mainly developing three fields: music, film and television and books." Over 50 Ningbo musicians working in Shanghai, Beijing, Hong Kong, Shenzhen, Australia, Los Angeles and Toronto attended a recent event to give suggestions for Ningbo's musical development. They also attended an event on Sunday to commemorate the 100th anniversary of the birth of renowned baritone Ge Chaozhi (1917-1998), whose ancestral home was in Cixi City. The city is coordinating its resources to encourage music-related industries, including instrument manufacturing, and attract talented professionals. A music-themed area, called Xingjiefang, has been built across from the Ningbo Grand Theater where people learn to sing and play instruments, and the Old Bund in Jiangbei District has become a popular place for singers to perform. “In the past year, we have attracted over 10 music education institutions and 30 original music composers to Jiangbei,” said Fang Bin, general manger of Ningbo Music Port Culture Development Co Ltd, which is in charge of the city’s musical development project. The city is also attracting outstanding arts professionals by helping them set up studios and granting subsidies of up to 800,000 yuan a year (US$120,500). The first group of studios was founded this year by 12 masters, including the studio of Yu Feng, Wu Yuxia (a renowned lutanist) and Wang Peng (a master of guqin, the Chinese zither). “We hope these masters can help Ningbo’s musical development by sharing their knowledge and skills,” said Chen. Rocky Music Library in Xinjiefang is known for its collection of 20,000 old records. The prosperity of the performance industry directly helps the progress of the city’s musical development. It brings together people passionate about hearing music and also those dedicated to expressing through music. Three high-level music festivals were held this year in Jiangbei, including the popular 14th China Chorus Festival at the Ningbo Grand Theater. The other two festivals were held at Sunhu Resorts, targeting young people with hip-hop and pop. “The host of great musical performances contributed a lot to creating a good musical ambience in the city and also drives other industries related to music, including education and instrument manufacturing,” said Fang. 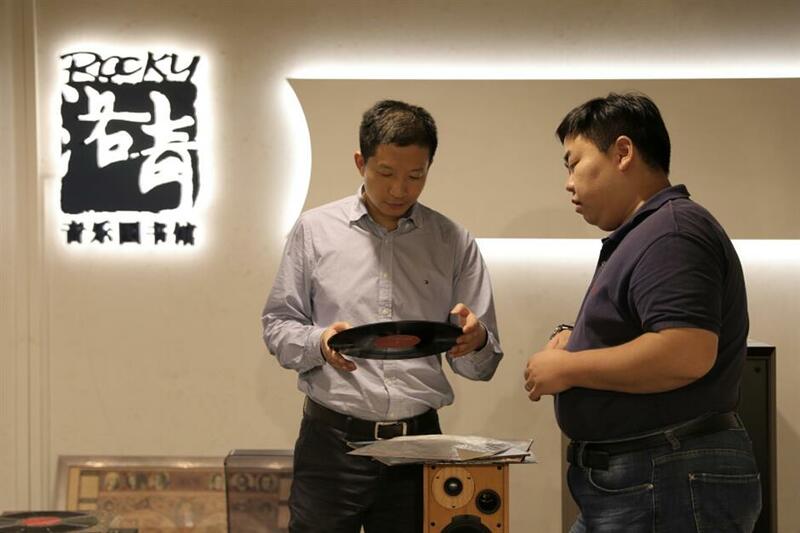 Ningbo is home to some of the country’s top music manufacturers, including Hailun Pianos and Soundking producing speakers. “The value of the output of Ningbo’s musical-device manufactures last year increased 8 percent from the previous year,” said Fang. Hailun Pianos is the only listed instrument maker in the city and its pianos are exported to Europe, Japan and America. “The mayor of Vienna told me that a piano manufacturer might not contribute too much to the whole country’s GDP,” said Chen Hailun, chairman of Hailun Pianos. “But it is essential to develop a good cultural atmosphere for the society,” added Chen.